Spinsolve at TU Delft, Netherlands, for the study of polymers. 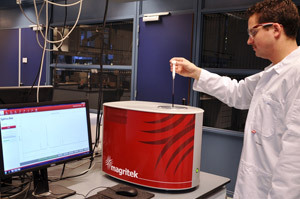 Wellington, New Zealand, 10th December 2013: Magritek, a leading provider of compact NMR and MRI instruments, report on the use of their Spinsolve Benchtop NMR spectrometer to study polymers at the Delft University of Technology. Dr Theo Dingemans is the Antoni van Leeuwenhoek Professor of Chemistry & Aerospace Engineering at the Delft University of Technology. His research in the Faculty of Aerospace Engineering focuses on the field of aerospace polymers to develop new polymeric materials which will ultimately lead to enabling technologies for the aerospace industry. His current emphasis is on tailoring and understanding the structure-property relationships of such new polymers. The research areas include liquid crystal network polymers (LCTs), matrix resins (PEEK-, PEKK-, PES-, PPS-, and epoxy-based) for composites and ballistics applications. His all-aromatic ester-based nematic network polymers are of interest to the electronic and aerospace industry because these polymers exhibit a unique combination of thermal, physical and mechanical properties, i.e. glass transition temperatures, Tg, in excess of 200 °C, high storage moduli (> 2 GPa above 200 °C) and excellent strength and elongation at break (~10% at r.t.). When applied in carbon fiber based composites, these polymers perform better than current state-of-the-art high-performance polymers such as PEI or PEEK. Dr Dingemans chose the Magritek Spinsolve system to use as a tool to check whether or not his group have synthesized the right molecule or not. In his lab, new polymers are designed and in order to do this, the team has to synthesize their own monomers. These are often aromatic/heterocyclic in nature so the spectrometer is very useful as it provides immediate information on the status of the chemistry. Once the pure compound is isolated, previously they would typically collect 1H and 13C high resolution spectra using a 500 MHz spectrometer located across the campus. 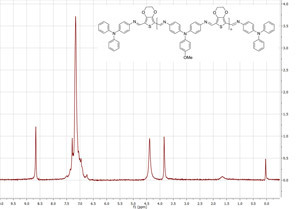 Spectrum of Azomethine obtained at TU Delft using the Magritek Spinsolve Benchtop NMR system.